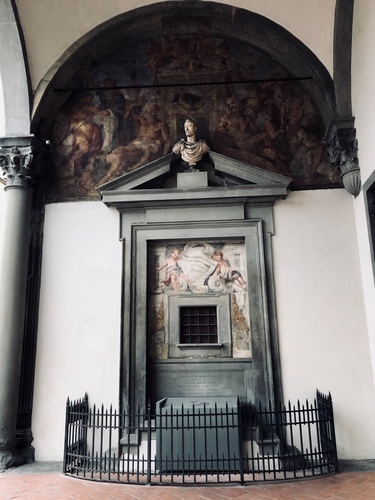 Located in Florence under the front entrance loggia of Ospedale degli Innocenti, the Foundlings Wheel was where the babies were left by parents who could not afford their care. The first child was entrusted to the hospital in 1445. For the first two centuries of Innocent’s operation, children were abandoned in a “pila”, on the far right of the porch, resembling a holy-water stone. In the early 16th century the Innocenti adopted the principles of the Counter-Reformation replacing the “pila" with a small window, so that foundlings could be left in a safer place. It seems that a crib, flanking the statue of Mary and Joseph, was built inside the window. Abandoned children played the role of the Baby Jesus. 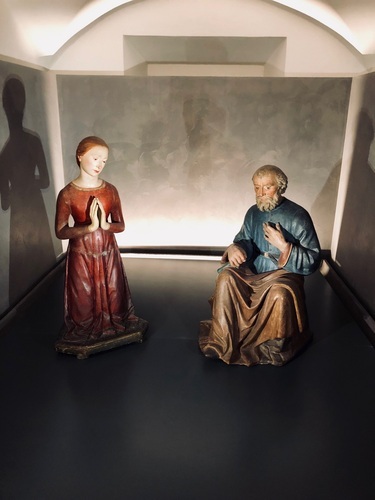 The two original statues of Mary and Joseph now can be seen in the Museo degli Innocenti. In 1660, the crib, known as "presepe", was replaced by the Foundlings Window in the northern end of the Loggia to harbor a large number of foundlings. The babies had to be little enough to fit through the tiny openings of the grate. Furthermore the “rota” - a revolving crib behind the window which allowed rotating babies into the building - guaranteed the anonymity of parents and the immediate warning of children's presence. All new-born babies entrusted to hospital were received by wet nurses. They meticulously documented the objects and messages left with them, to have a chance of future recognition and of a change to rebuild their identity. Messages and objects are now exhibited in the Museo degli Innocenti. The number of children rose sharply in the second half of the 18th century, reaching the 1,000 new admissions a year. In 1875 the grated window was sealed and babies are no longer abandoned anonymously. A deliver office was instituted to receive the children entrusted to the Hospital’ care. "QUESTA FU PER QUATTRO SECOLI / FINO AL 1875 / LA RUOTA DEGLI INNOCENTI / SEGRETO RIFUGIO DI MISERIE E DI COLPE / ALLE QUALI PERPETUA SOCCORRE / QUELLA CARITA' CHE NON SERRA PORTE". "This was for four centuries, until 1875, the "Ruota degli Innocenti", secret shelter of misfortune and guilts to which perpetual charity, that doesn't shut doors, assists".